It was with my mother that I’ve learned to appreciate a refreshing “clericot”. This is a drink the British took to South America as “claret cup”, which later became “clericot”. According to Darcy O’Neal it was the punch of choice for parties and the drink most enjoyed by the British in the 1800’s. It’s very similar to the Spanish “sangria” and it basically consists of wine with some sort of fruit and a sweetener (usually white sugar). Hundreds of different “sangria” and “clericot” recipes can be found on the net. 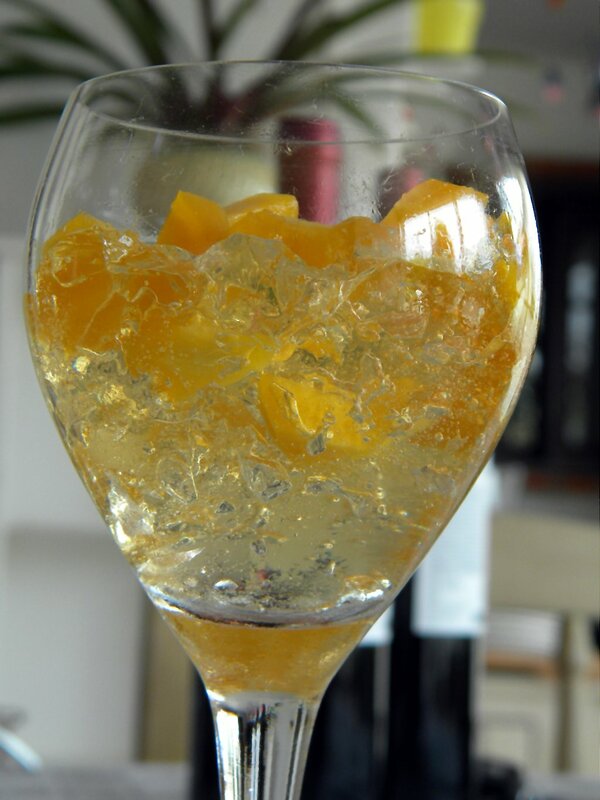 Actually in Brazil, Uruguay and Argentina, as far as I know, the main difference between “sangria” and “clericot” is that the later is prepared with white wine (regular and/or sparkling), while in the former reds are used. This was my mom’s choice drink for Christmas Eve (remember that Christmas is during the Brazilian summer), and she had her own recipe, which included diced fruits (mainly fresh apples and canned peaches – thus you don’t need to add the sugar), 1 bottle of Champagne, 1 bottle of white wine (usually a Riesling), 1 bottle of sparkling mineral water and lots of ice. A few weeks ago I was offering a Sunday lunch for some friends and decided to try something different (at least it was completely different for me). The idea was to transform my mom’s “clericot” recipe into a dessert. What I did, and you can try it too, was to dissolve 2 powdered neutral gelatin envelopes in 2 cups of cold water and waited it to hydrate for a couple of minutes. I then added 1 1/2 cups of sugar and heated the mixture until the gelatin and the sugar dissolved completely (you must be careful not to overcook the gelatin, after all it’s a protein). I then transferred it to a large bowl and added 1 bottle of Champagne (in fact I used a Spanish cava) and 1 bottle of Chardonnay. I gently mixed everything (gently, as you won’t want to lose all the gas) and took the mixture to the refrigerator. All this was done one day ahead. Just before serving I diced several canned peach slices, scraped the gelatin with a fork, and arranged them (almost in layers) in white wine glasses. I have no reason to be modest, then let me tell you, the result was excellent. You could even feel the bubbles as the gelatin melted in your mouth and the wines filled your tongue and palate with their distinctive and refreshing flavors. My mom sure would have loved it. Just remember, the alcohol is still there, thus there goes a piece of advice: go easy on it and keep your kids away. Of British origin, the crumble is simply composed of fruits topped with a mixture of fat, sugar and flower and baked until crisp. Although it’s a quite simple dish, on the Internet you’ll certainly find hundreds of different recipes employing an incredible array of fruits. My favorite one was prepared by Olivier Anquier, an ex-model who became a chef and TV star after immigrating to Brazil in 1979. Besides having a captivating smile, he usually offers simple and but quite nice recipes in his TV shows and web site. Olivier employed pears, which I substituted by apples. Just mix about 200 g of wheat flour with 100 g of brown sugar and 80 g of butter, using your hands, until you get a texture similar to that of breadcrumbs. Butter a ovenproof dish and place the sliced apples sprinkled with a bit of cinnamon. Cover with the crumble and bake in the oven for 20-30 min at 180 ºC (around 356 ºF). ...topped with a mixture of fat (butter), flour and sugar (brown sugar). Crumbles are usually served with Chantilly or ice cream, but Oliver prepared a syrup by melting around 80 g of butter with a similar amount of brown sugar, to which 40 ml of whiskey are added. The mixture was left to boil under low heat for a couple of minutes and 100 ml of heavy cream then added. Just steer for a few moments and and it’s ready. The final product is simple but irresistible. This is, in my opinion, a nice companion during a rainy Saturday, along with a cup of freshly prepared Brazilian coffee, to watch an old movie on TV.